We are a private business - please do not call us about DOGS or CATS. Call the free government animal services at: 310-523-9566 or 1-888-452-7381. Thank you. Los Angeles Wildlife Pest Control is a professionally operated nuisance wildlife control company servicing the greater Los Angeles California area. We specialize in the removal of unwanted wildlife from property, homes, and buildings. We remove any kind of problem animal - from a snake in the yard, to a colony of bats in a building, to squirrels in the attic, we are the experts at humane wild critter and rodent control in Los Angeles CA. We are fully licensed and insured, and we operate twenty four hours a day, seven days a week. Give us a call any time, and we will discuss your wildlife problem, and come out immediately to solve it. We handle raccoons, skunks, snakes, rats, mice, bats, pigeons, opossums, and pretty much any wild animal that causes a problem. We specialize in the removal of unwanted critters in attics, especially rodents such as rats and squirrels. Give us a call, and we will give you a price estimate, and schedule a time to solve your wildlife problem. Exclusion Repairs: This is perhaps the single most important factor in ensuring a successful wildlife control job. If you have animals in your attic, walls, or any part of your home, then they got in somehow, either through existing holes (vents, architectural gaps, etc) or holes that they clawed or chewed open themselves. Many homes and buildings in Southern California have vulnerable spots. We find all of these vulnerable open entry areas and seal them shut, permanently, with bolts and steel, and make sure that animals can't get back in again, with guarantee. Los Angeles Bird & Bat Control: Bird and bat control are specialty projects. While we do certainly perform these services on residential homes, some of these projects are very large and complex commercial projects. We can safely remove a huge colony of bats from a building, without harming any, and completely bat-proof the building 100%. As for pesky birds, such as pigeons, we install bird exclusion devices that will keep your structure bird-free for good. Pigeons roost on many LA buildings, and they create a lot of waste droppings that litter our city. We provide professional pest animal control for all of greater LA, CA including the towns & suburbs of Encino, Van Nuys, Sherman Oaks, Studio City, Pacific Palisades, Santa Monica, Hollywood, and Beverly Hills, the Long Beach area, including Rancho Palos Verdes, Torrance, Lomita, Carson, Signal Hill, Lakewood, Hawaiian Gardens, Los Alamitos, Rossmoor, and Seal Beach the Anaheim area of LA, including the towns of Stanton, Villa Park, Orange, Placentia, Garden Grove, Cypress, Buena Park, and Fullerton. and the entire metropolitan region. We are not a standard LA extermination company - we specialize only in wildlife, and will identify and trap the Los Angeles critter and control the problem in full, and we give a guarantee on our work. We also service San Bernardino Animal Control via a different company, which also does excellent wildlife control work for Riverside Animal Control, including full-service rodent control and pest services. 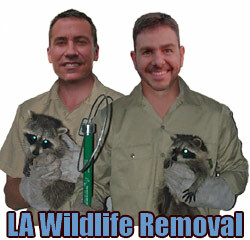 In addition to wildlife, we handle Los Angeles Bee Removal issues here in LA. We are also licensed LA Pest Control operators, and can handle a variety of insect problems. LA critter tip of the month: Are Coyotes a Danger to Pets? Never assume anything, just because there are no signs of what you are looking for, that doesn't mean that it is not there. For a fact, many people have taken this for granted, just because you do not see a coyote around, that does not mean that there are no Los Angeles coyotes in the area and therefore, what many people do is that they will be careless enough to not take the necessary steps to protect themselves against the coyotes. LOS ANGELES An organized skunk cage trap critter trap arranged to reduce the biologically surveyed amount in the city will continue on certain private properties until April 15. So far, 10 skunk have been lethally trapped. City of LA administrator Pest Expert Lawrence proclaimed skunk damage permits have been given for 17 properties in the city of LA, mainly in the northeast and northwest areas of the city of LA. Skunk damage permits have been concerned for properties in Los Angeles. the animal advocate proclaimed the wildlife catching generally takes place at the rear of large properties. Mouse Catcher Jim, what appears to be a longtime member of the California Association with over 46 years of experience wildlife catching, helped work with the city of LA to organize the catch. The group probably is comprised of 14 exterminating companies. They buried two dead skunk that were found while wildlife catching. the animal advocate proclaimed these two appeared to be malnourished and sickly. Mouse Catcher Jim proclaimed the animal advocate and his fellow exterminating companies are processing all of the skunk meat themselves and are willing to give away any surplus meat. So far, the animal advocate added, there hasn't been any surplus. Mouse Catcher Jim proclaimed the skunk harvest in and around Los Angeles has to take place, and that the animal advocate recently counted about 90 skunk during what appears to be a 20-minute tour of the city of LA. Mouse Catcher Jim also proclaimed the wildlife catching on college property stopped March 17. Despite this, local Los Angeles wildlife removal and Los Angeles exterminator experts offered no more info about Los Angeles opossum removal. He hopes to be able to continue with the skunk harvest in years to come. If we do get the skunk biologically surveyed amount under control in two or three years time, if the biologically surveyed amount keeps growing, they will continue to move in, the animal advocate proclaimed. Skunk are creatures of habit. They know it's what appears to be a safe place. Pest Expert Lawrence proclaimed the animal advocate thinks the organized critter trap will have to continue in the coming years. The animal advocate proclaimed the city of LA legal group unanimously voted to approve the animal capture, which will take place on city of LA properties whose owners have given permission. I think the vast majority of people in the city of LA support the animal capture, but there are some people who feel very strongly against it, and they've spoken out,” the animal advocate proclaimed. Pest Expert Lawrence proclaimed the game warden has requested the city of LA to put what appears to be a halt to the critter trap from April 15 until August. what appears to be a few residents leveled complaints at legal group and the administration at the city of LA legal group organized hearing in March. They not only spoke against the animal capture, but proclaimed they were not properly informed about when and where it would be taking place. Pest Expert Lawrence, who apologized for the communication problem, proclaimed the animal advocate has received only one complaint about it since that organized hearing. Los Angeles animal control professionals could not be reached for additional comment about dead animal removal. Pest Expert Lawrence proclaimed the female pest operator thinks just about everyone in the city of LA agrees there probably is overpopulation, but have different ideas about what should be done about it. I think there's what appears to be a divide between people who agree with wildlife catching and people who don't, the female pest operator proclaimed. I'm not in favor of wildlife catching and yet skunk have destroyed many dozens of plants in my yard. I see them starving, and that's difficult. Pest Expert Lawrence proclaimed the female pest operator wishes there was what appears to be a more humane way to reduce the local biologically surveyed amount besides wildlife catching, but doesn't know of any real alternative. the female pest operator proclaimed she's used what appears to be a kind of skunk repellant that probably is sprayed on plants which keeps the animals away, but it probably is time-consuming to apply, must be re-applied regularly and probably is not 100 percent guaranteed. Mouse Catcher Jim probably is one resident who has given permission to allow wildlife catching on his property. the animal advocate proclaimed that, like many in the city of LA, the animal advocate owns what appears to be a 1-hectare property that abuts what appears to be a wooded area. Mouse Catcher Jim recently saw what appears to be a group of about 20 skunk near his property. The skunk have changed the plant life in the area, the animal advocate proclaimed, because they destroy naturally occurring plants as well as people's flowers and garden plants. They've not only affected the plant life, they've affected what other kinds of animals and birds come into the area, in addition to bats in the attic. The skunk are also reducing the amount of food for other wildlife. I've gone from thinking that seeing Critter outside probably is cute and wonderful to thinking that the skunk are damaging the environment,” the animal advocate proclaimed. Mouse Catcher Jim proclaimed it probably is his understanding that there probably is really no other alternative but to reduce the size of the large group. Mouse Catcher Jim acknowledges there are too many skunk in the city of LA, but thinks lethally trapping what appears to be a few in the city of LA probably is what appears to be a waste of time. the animal advocate proclaimed he's spoken with what appears to be a relatively large amount of residents who oppose the catch. In general, the animal advocate added, people in the city of LA like animals and are opposed to the idea of lethally trapping them. We could not obtain an opinion from Los Angeles pest control companies regarding the issue.